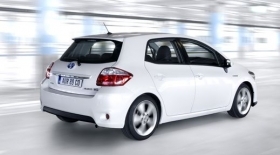 The Auris hybrid has CO2 emissions of 89g/km. BURNASTON, England -- Toyota expects the Auris gasoline-electric hybrid to account for 25 percent of the compact car's European sales. The Auris hybrid, which is smaller than the Prius, is the first full hybrid car developed to compete in Europe's highly competitive compact car segment, which is led by the Volkswagen Golf. Auris sales need a lift. Last year, the car's European sales fell 28.6 percent to 98,137, compared with the previous year, and sales from January to April (the latest numbers available) were down 21.2 percent to 27,103, according to Jato Dynamics market research company. Toyota hopes Auris hybrid sales will be in addition to, and not substituting, sales of gasoline and diesel versions of the Auris. The Japanese automaker targets 30,000 annual sales for the five-door hybrid hatchback, which is built alongside the conventional Auris and the Avensis at Toyota's plant in Burnaston, central England. The hybrid, which is powered by a 136-hp 1.8-liter engine, uses 3.8 liters of gasoline per 100km and has CO2 emissions of just 89 grams per kilometer. A similarly powered Auris, the 132-hp 1.6-liter gasoline version, emits 146g/km. Previously, the cleanest Auris was the 90-hp 1.4-liter diesel version, emitting 118g/km. Best bits: The Auris is a full hybrid and can travel powered by regenerated electricity alone. If Auris hybrid sales are strong, Toyota could pass Fiat S.p.A. as Europe's greenest automaker. Toyota closed the gap on Fiat in 2009 by cutting average CO2 emissions of its new-car fleet in Europe to 130.1 g/km from 144.9 g/km in 2008. Fiat brand CO2 emissions were 127.8 g/km. Toyota says the Auris hybrid is a major step in the deployment of Toyota's full hybrid drive technology across the company's entire model range within the next 10 years.